Can We Solve Homelessness? is a new feature with video interviews on Thirteen / WNET New York. Read more in the fact sheets published by The National Coalition for the Homeless. Christina Ray's daily serving photography project documents her crossings with New York's "We Are Happy To Serve You" coffee cups. The cups surface in corners, snow banks, trash and counter tops in what appears to be all over Brooklyn. The project makes you realize that we do infact run accross mass produced objects like this everyday. The objects have an intimate history in that they were at one point desired by a consumer, but once their contents are gone, they are disposed of in haphazard methods. By photographing them in this disposed of state, it gives new intimacy and attention to the objects. Conrad Bakker's Untitled Projects: Sidewalk Economies (San Francisco) is a digital photography show of is his replication of everyday objects in the street. Notably, rubber bands and pen caps are replicated out of balsa material and then placed next to or instead of the original object in the street. The replicas are left to drift and lead their own lives once the photograph has been taken. This project is currently on exhibition at San Francisco's < a href="http://www.soex.org/jan7_feb12_2005.html">Southern Exposure Gallery. Bakker is also exhibiting at MassMoCa in Trade Show, a show "of eight artists and collectives who bring the world of business into art". The show also features Glowlab friend Christine Hill. Amazon's new A9.com Search has a psychogeographic twist. Search for any store type and A9 will show you a picture of the store front. You can .walk in any direction up or down the blocks to "see" whats there. I hope psychogeographers will use this as a catalyst for their own projects. If so, let Glowlab know about your progress! Remapping High Wycombe is a project in England that is making use of derives and other psychogeographic techniques to remap High Wycombe. Specifically referencing Glowlab friend Social Fiction to begin a few derives, the participants seem to successfully allow the urban landscape to guide them so they find the hidden places of their town. The blog has very nice poetic journal entries accompanied by photographs taken during the derives. Check out Volksboutique's latest project, A Consumer's Guide to Times Square Advertising. "The information revealed," says Christine Hill, "alludes to impossible maths, huge numbers, surprise revelations and wild discrepancies...and the Wheel-as-tool organizes the information handily so you can always have it at the ready!" It's quite nice -- beautifully designed and packed with facts. We received ours in the mail today [and will "archive properly" as instructed!]. You can also pick one up at locations listed on the site. As some of you may know, we've been working behind the scenes for the past several months to build ourselves a brand new website. We're excited to announce that beginning in mid-March, Glowlab will be published in the form of a bi-monthly web-based magazine for psychogeographic projects. Our regular members and guest contributors are getting set to bring you fresh psychogeographic adventures in the form of performances, walks, interventions, multimedia/tech-based work and more. Project documentation and related articles will be published in every issue, and we'll offer a running calendar of offline events for public participation. Each issue's publication will be accompanied by a Glowlounge event in NYC where contributors will present their projects in an informal setting. The Glowlab website will also include a news blog and an online forum to discuss psychogeography. Many of you have written to ask about our annual psychogeography festival, the Conflux. Because our focus right now is on bringing you a great website, we've decided to team up with our friends in Providence this year who are holding their second annual "Provflux." Partly inspired by the Conflux, this is a similar weekend-long event bringing together psychogeographers from around the world. The dates are May 13-15 27-29, and we encourage you to get involved. For questions about participating, please contact John J McGurk: alobswitt [at] gmail.com. The Glowlab crew will be there, and we'll present projects and events related to our second issue which we've titled "ADJACENT" in the spirit of a collaborative effort with the Providence folks. We look forward to seeing old friends and making new ones in May. We've built a great group of core Glowlab members over the past couple years, and on behalf of all of them I'd like to say thank you for supporting us. We can't wait to bring you our first issue in March, titled "STRANGER." - Until we switch over to the new site in March, we won't be adding any new content to our regular sections, only the news. You'll notice that the image links under "contents" are dimmed; however, you can still read the archived articles there. Europe knows how to do it. Kunst i Nordland/Art in Nordland "receives extensive support from the Norwegian Cultural Council." 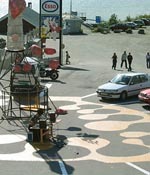 Artistic interventions realized with public installations, performances and other endeavors will be executed through-out 2005 in Norway. "The aim is to examine issues relating to the local context, the communicative potential and function of art in the contemporary world, and on a more theoretical level to discuss “site-specificity” as an artistic genre and strategy." This examination will be collaborations with local communities, municipalities and towns thereby furthering the contemporary artistic context beyond the artists and art world. The project has the potential to be a collective focus upon intervention which can be realized in many interpretive facets. Much like the current Mass MoCA show Interventionists, (Conflux participant Kanarinka is in that show) the artists involved will be bonded through their public execution, but will have the ability to create individualized interpretations. Graffiti Taxonomy is a kind of handwriting analysis of tags in LES and Harlem, NYC. "The intent of these studies is to show the diversity of styles as expressed in a single character." The artist is fi5e, a graffiti artist and digital media artist in New York. fi5e is looking for other tags to be contribted to http://ni9e.com/graf_analysis.html to be analyzed to "create visualizations based on the speed and direction of the original movements". Check it out and send them some stuff.